Sunday’s game between the Oakland Raiders and San Francisco 49ers was one of the sloppier ones that will take place this season. 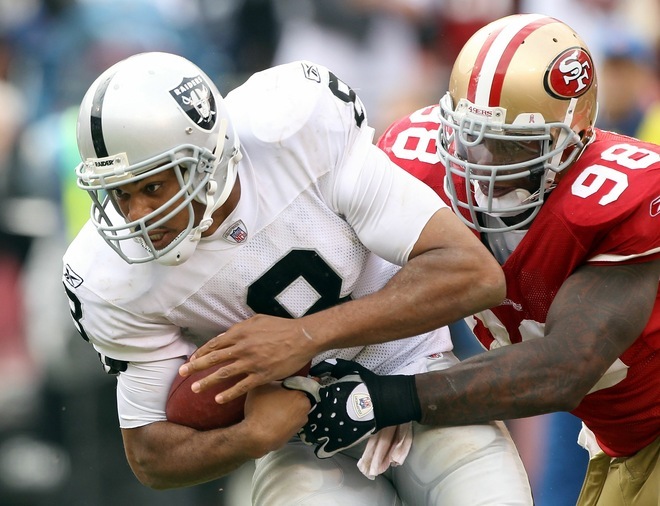 Neither Raiders quarterback Jason Campbell or the 49ers’ Alex Smith stood out at all. Yet it was the pair of touchdown passes Smith tossed in the second half which made all the difference as San Francisco outlasted Oakland 17-9. How sloppy was the game? San Francisco managed to commit 11 penalties while Campbell threw a pair of interceptions. The first half was rather uneventful as a total of three field goals – two by Sebastian Janikowski and one by Joe Nedney comprised the scoring in the first half. It is pretty safe to say that a lack of execution, especially by Oakland, contributed to the lack of scoring in the first half. Business began to pick up in the third quarter as Smith tossed a 32-yard TD pass to Michael Crabtree, putting San Francisco ahead 10-6. After Janikowski booted a 40-yard FG with 8:21 left in the game, allowing the Raqiders to get to within 10-9, Smith would put the 49ers up for good when he threw a bullet to Vernon Davis for the winning score. As previously noted, neither QB did anything special; Smith went 16-of-33 for 196 with 2 TDs while Campbell went 8-of-21 for 83 yards (not a typo, foks – 83 actual yards) with a pair of picks. Frank Gore accounted for 149 of San Francisco’s 158 rushing yards while Michael Bush led the Raiders with 47 yards on the ground; Louis Murphy ran once for 43 yards. Crabtree led all 49ers receivers with 4 receptions for 57 yards and a TD while Josh Morgan caught 3 for 49 yards. Zach Miller led the Raiders receivers with a pair of catches for 48 yards. San Francisco (1-5) will seek their second win of the season as they travel to Charlotte to take on the Carolina Panthers next Sunday while Oakland (2-4) plays a divisional tilt as they take on the Denver Broncos – also next Sunday.